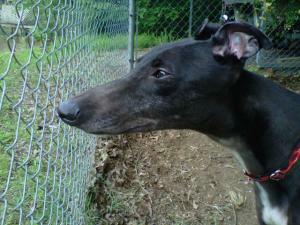 FIre is a 3 year old, small, black, male that raced at 66lbs. His birthday is Jan 28th. Fire passed his cat, small dog and kid tests so should be fine in a home with them. He is a quiet guy so should also be great in an apartment or townhouse. He seems like a smart guy that picks up on things fast. He picked up on going to the door and letting his foster family know when he needed to go outside right away and has not had one accident in the house. Update: Fire has become one of the sweetest dogs that his foster home has ever fostered (they have fostered a lot of dogs). He tries his best to be a big lap dog and follows his foster parents around. He loves people and wants nothing more than to stay close to them. This guy would love to lay on the couch and snuggle. He seem like a very tolerant guy that would be excellent with other dogs because he is unusually good with two puppies living in his foster home.